I hate Reply All because it’s evil. It just is. 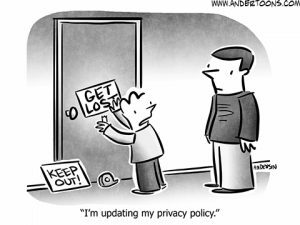 And you’d think that in general people are email savvy enough to know when and when not to use it, but there’s still plenty who aren’t. And they make me crazy!!! An innocent email about a scheduled call, and two days later I’m forced to read two recipients talking about teddy bears or something. Auuggghhhhh!!!! I maintain that you should have to pass some sort of email training before you get a code that will allow you to use Reply All. Or at least hide it in a menu somewhere where email luddites can’t find it easily. So one afternoon, after a particularly vein-throb-inducing Reply All, this little cartoon popped into my head. 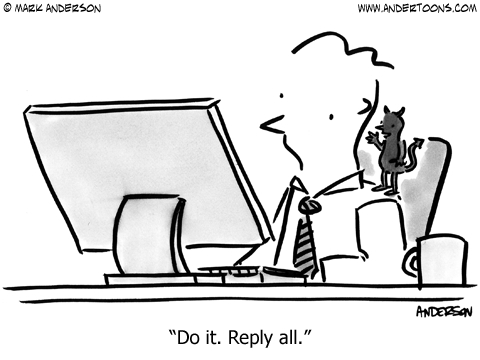 Reply All is my BIGGEST office pet peeve! 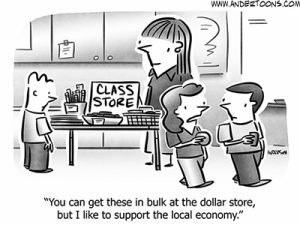 I want to blow up this cartoon and post it all over the breakroom — thanks for a laugh!